laurafallulah: Hey there doll face! Look what arrived in the post for my Notonthehighstreet shop this week! 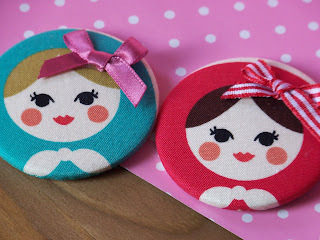 I almost fainted from the cuteness that is these Paperfish doll face badges. I love how these remind me of those old simple childrens book illustrations that you used to get when I was young. Plus they have ribbon bows in their hair so whats not to like. Also with them were these beautiful flora felt badges, slightly more grown up in feel but equally as delicious. Again they have added cute appeal as they have button centres, gotta love how Kirsty from Paperfish has a eye for those kinds of details. So if you are looking to a healthier alternative to an easter egg or just fancy something to put a spring in your step now that the sun has finally shown itself, head on over to the shop to purchase these little darlings. PS I am running low on both the Russian doll badges and the Teacup badges now so buy them now to avoid disappointment.